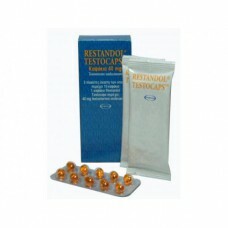 Restandol(Andriol) is an oral steroid. Its active substance is Testosterone Undecanoate.Restandol (Andriol) is a revolutionary steroid because, besides methyltestosterone, it is the only effective oral testosterone compound. Testosterone itself, if taken orally, is ineffective since it is reabsorbed through the portal vein and immediately deactivated by the liver. Professional bodybuilders usually use it only in the pause between cycles but amateur bodybuilders, females and athletes too concerned with safe usage can use it in separate cycles. Testosterone undecanoate is being converted in the body into dihydrotestosterone, which almost does not aromatize, therefore, estrogen-related side effects are not an issue. 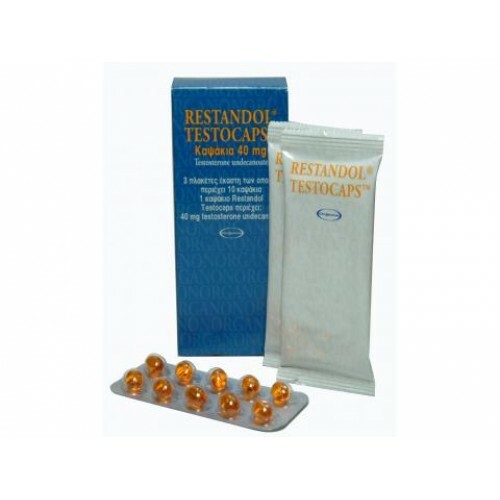 Restandol(Andriol) is taken orally, therefore, on the first glance, it cannot bypass the liver where all oral testosterones are being destroyed. However, pharmacologists invented following solution: testosterone undecanoate (Andriol) is being made in capsules, which contain very specific fatty acid, which makes andriol bypassing the liver and reach it's target through lymphatic system. Unfortunately, it did not work out as planned completely. Part of substance is being absorbed through lymphatic system and converted to test as planned. Another part is moved out of the body faster than it become effective. The good thing is that the liver is not affected. (Restandol)Andriol is useless for "serious" bodybuilders on heavy cycles and mostly used to improve libido during PCT (post cycle therapy) to maintain test level. However, it has it's own unique niches! Because of low testosterone release it is extremely safe and could be used by cautious athletes and females. Furthermore, it is not detectable just in one week after cycle is over thus making it a good drug when contest is coming close. Extra advantage of Andriol is that it does not affect natural testosterone production unless taken too long and in high dosages. Regular daily dosage of testosterone undecanoate varies from 240 mg (6 caps) to 480 mg (12 caps) split on three parts with equal time gap. When is used between cycles, it is good idea to combine (Restandol)Andriol with Oxandrolone (Anavar). This will help to maintain testosterone level and thus libido and prevent muscle loss. Also Restandol / Anavar combo could be used as a safe standalone cycle: 240 mg of andriol / ED plus 30-40 mg Anavar / ED with possible addition of Primobolan (400-600 mg/week) for ten-twelwe weeks. This is very safe combination. PCT is needed only if included. Athletes over forty can find this very effective and safe, too. Another, stack is andriol 240 mg/week+anavar 20 mg/ED+deca 200 mg/week for 10-12 weeks. Some PCT (Tamoxifen, Clomid) are necessary. (Restandol)Andriol is testosterone ether and androgen-related side effects might be an issue in theory. However, due to weak action these effects are so weak that andriol could be considered as very safe drug unless the dosage is too high. Only dosages above 400-500 mg start showing all common testosterone side effects and affecting natural hormone production. No PCT (post cycle therapy) is needed below 400 mg / week. Andriol (testosterone undecanoate) is the only drug, which could be used by females without any danger. Daily dosage is 120-240 mg. Also it well combines with anavar (oxandrolone) and sometimes, primobolan. For instance female athlete can do 120 mg of (Restandol)Andriol / ED and 50 mg of / week for four-six weeks then make a pause for three weeks and continue with 50 mg/week along with Winstrol (stanozolol) 10 mg/ED for another 4-6 weeks. Moderate PCT is recommended.